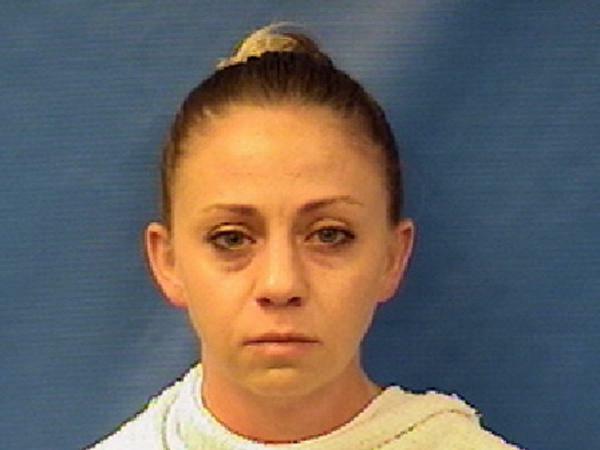 The Dallas Police Department says Officer Amber Guyger's employment has been terminated. On Sept. 9, Guyger was arrested and charged with manslaughter, as NPR's Bill Chappell and Barbara Campbell reported. She posted a $300,000 bond and was quickly released. After completing an internal investigation, the police department said Guyger was "terminated for her actions" during her arrest. "An Internal Affairs investigation concluded that on September 9, 2018, Officer Guyger, #10702, engaged in adverse conduct when she was arrested for Manslaughter," the police statement read, without providing details. It added that Guyger may appeal her termination. Guyger had worked for the Dallas Police Department since November 2013. Before she was fired, she "remained on the city payroll on administrative leave," The Texas Tribune reports. As KERA has reported, lawyers for the victim's family say Guyger's version of events "contradicts accounts from neighbors in the apartment complex." "An affidavit for an arrest warrant says the officer found the door ajar at what she thought was her own apartment," NPR previously reported. "It says it was dark inside, she saw the silhouette of a man, and she gave him orders that he didn't follow." Guyger said she called 911. Jean died at a local hospital of a gunshot wound to the chest, according to the Dallas County Medical Examiner's office, which ruled his death a homicide. A lawyer for Jean's family has told local media that two witnesses heard a woman knocking on Jean's door, apparently asking to be allowed into the apartment. The Dallas County district attorney has expressed a desire to present the case to a grand jury — which, as KERA notes, could result in stiffer charges. "We're looking at every conceivable, possible thing that we can look at to be able to bring this case to the grand jury," District Attorney Faith Johnson told NPR's Here & Now last week. "And it won't be tomorrow, it won't be next week, because we say to people, 'We want to get it right.' "
Jean's funeral earlier this month drew a crowd of hundreds at a church near Dallas, KERA reported. "We will not stand by quietly as what we believe to be false narratives that diminish any culpability for the offending officer are advanced," Minister Sammie Berry was quoted as saying by KERA. "The undeniable reality is that he was slain in his home, where he had the right to be and was abiding by the law."